It is thought that the ancestors of dolphins lived on land in a time long past. Once the ancestors of dolphins started living in water, they found out that the medium of water was hard to see through – an object 10-15 meters away is the farthest a dolphin’s eyes can see even if waters are crystal-clear, not to mention dark or murky waters. So the ancestors of dolphins decided to possess an ability that would enable them to “see” with their ears by listening to echoes. Sound waves travel through water at a speed of 1.5 km/sec, which is almost five times faster than sound traveling through air. Dolphins produce clicking sounds (localization pulses) to make the sound waves bounce off objects in the water and return to the dolphin in the form of an echo. High-frequency sounds do not travel far in water. Low-frequency sounds travel farther because of their longer wavelength and greater energy. Echolocation is used by dolphins for determining distance to a very small target (5-10 cm) within close range (5-10 m). It is thought that dolphins can locate shoals of fish at an intermediate range (up to several hundred meters) by using echolocation. Recent studies of Australian scientists indicate that Atlanteans, the people who lived on a legendary island first mentioned by Plato, may have been the ancestors of dolphins. “No matter how weird it may appear, dolphins used to have two legs and a couple of arms in place of fins. They lived side by side with the people of the Stone Age,” said Dr. Leslie Huskerway, a biologist. Researchers at Melbourne University conducted a research into the human DNA and that of marine mammals. Using comparison as a method of study, researchers found that the dolphin was the nearest relation of the human being. 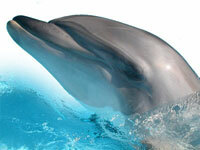 The dolphin may have parted company with Homo sapiens some 250 thousands years ago. Scientists have long known that the creatures had lived on land in the distant past. Their highly developed intellectual powers have always intrigued researchers. “A dolphin brain is much larger that that of a human being. And dolphins use a very complex language while communicating,” Dr. Huskeway said. Dolphins have an inexplicable attachment to humans. There are dozens documented accounts about dolphins saving humans who suffered shipwreck. At a time when they lived on land, their intellectual development was probably even higher than that of the people from whom modern humans descended. The discovery helps us see the Golden Age myths in a new light. Almost every nation of the world had a myth of the Golden Age. The myth centers on a civilization whose members controlled the world in days of old. A great civilization of Atlantis, an island that is said to have existed in the Atlantic Ocean and to have sunk beneath the sea, is mentioned in the works of Aristotle and other scholars of ancient Greece. A person of enlightenment used to consider himself the crown of the Creation since he was the only one who possessed reason. In the second part of the 20th century scientists started debating the issues relating to a dolphin’s intellectual powers. Professor A. Portman at the Basel-based Institute of Zoology (Switzerland) came up with a scale for measuring intellect. A human being (214 points) was found to be the smartest creature of all. A dolphin was a runner-up with 195 points. An elephant (150 points) was rated as No 3. An ape arrived fourth with 63 points. The following fill the slots at the bottom of the scale: a zebra (42 points); a giraffe (38 points); a fox (28 points). A hippopotamus scored only 18 points, and therefore was classified as the stupidest creature under the sun. American neurophysiologist John Lilly has conducted experiments involving dolphins for many years. The scientist worked at his laboratory located on St. Thomas, an island of the Virgin Islands of the United States. The results of his research enabled Lilly to reach the following conclusion: the dolphin will the first living creature on Earth to establish conscious contact with the human being. That is the reason why the dolphin has a large brain with the cerebral cortex, a complex language and an ability to communicate displaying quickness of intelligence. A dolphin brain and a human brain seem to be two of a kind when it comes to certain brain characteristics e.g. the ratio of its weight to the body mass, the intricately folded cerebral cortex. Incidentally, humans use the above characteristics to prove intellectual superiority of the human race. Lilly is confident that scientists will make enormous progress in many fields once verbal contact between humans and dolphins is established. Dolphins will be no longer used as guinea pigs. They will turn into scientists’ colleagues, making contributions to scientific progress.